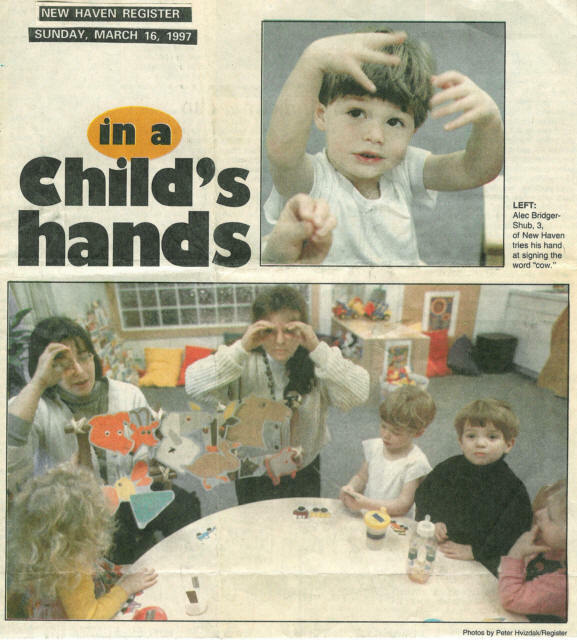 March 16, 1997 “All the children love her so much, and it makes them very happy to be able to talk to her in sign language and have her answer,” says Malmquist. “They don’t treat her any differently. It’s as though when they speak to her through signing, it’s just a natural way for them to communicate. What do the children say to Chauntel with their hands? "I say everything to her," says Sivahn. "Usually I say, 'Do you want to play with me?' And if she does, then we figure out what to play." Tammy Garris, Chauntel's mother, said her daughter has made lots of friends at the child care center, and she sees that having all the children exposed to sign language makes it possible for them to see Chauntel as a person, rather than someone with disabilities. “I'll come there to pick her up, and she'll be signing something - and because her signs are adapted, sometimes I won't quite be able to figure out what she means - and one of the other kids will explain it for me," she says. "One day I came in, and she was signing allover the place, the equivalent of babbling, really – and Emily ,one of her friends came over and said, 'Chauntel wants to play with the blocks.’ And Chauntel nodded and smiled really big. That was what she meant." Chauntel gets her share of birthday party and play date invitations, too, which Garris says, makes her feel overwhelmed with happiness at the acceptance her child has found in this center. Chauntel's twin sister, Samantha, who does not have a disability , is also in her class, and also has learned to sign to communicate with her sister. "The first time somebody came up and said they wanted to have Chauntel over for a play date without Samantha, I could have cried I was so happy," said Garris. Another day, I went to the school, and it was muddy outside, and Chauntel was having a little trouble making her walker go - and so the children had moved boards over so the walker could get to the other part of the yard, where they were playing. These were 3- and 4-year-olds, doing this without a teacher telling them to!" This kind of compassion for people with disabilities is one of the side effects Malmquist hoped for when she hired Dawn and started the sign language program. In fact, it was Malmquist's young daughter, Molly Wessel, who first inspired her to think of including sign language in the curriculum. Molly, now 6, had always been interested in watching sign language performed on "Sesame Street," and for her third birthday party, she wanted a "sign language" birthday party. That's when Malmquist realized that even children who can hear would benefit from being taught simple signs. And this fit in with her plan to make the child care center inclusive, finding places for children with disabilities as well as children of many different ethnic groups. The idea took off beyond her wildest dreams. "Signing has become MolIy's entry into the world of people with special needs," she says. "Even now (that she's no longer attending Creating Kids) we'll go somewhere, and I'll see her signing to people with disabilities.